Instead of juicing the orange and then adding in a thickener (cornstarch is what is used most-which is not considered whole), I used the whole orange and even 1/2 of a mango. I’m sure 1 1/2 orange would work as well. The fiber from the fruits thicken the sauce up just fine. I have also used this recipe with honey and maple syrup and they both work equally well. 2 lb. boneless, skinless chicken breast or thighs, cut into bite size pieces. Put the sauce ingredients into a high powered blender. In a large saute pan, heat the coconut oil, using medium high heat. Add the chopped chicken and cook until it turns a light golden brown approximately 7-8 minutes, turning over the chicken while cooking. Add the sauce from the blender to the cooked chicken. Coat the chicken with the sauce and let the sauce heat up a bit. 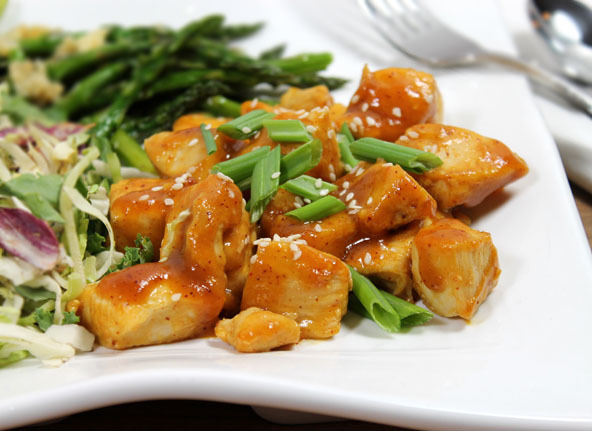 Top the orange chicken with the optional green onions and sesame seeds when plating.